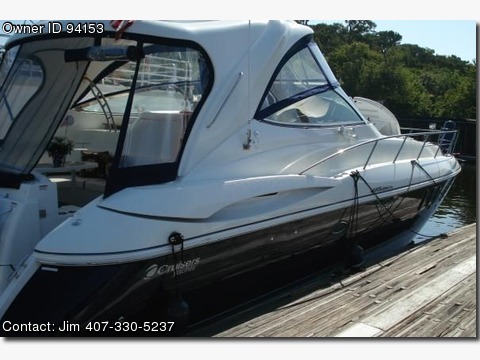 Call Boat Owner Jim 407-330-5237 407-323-2026 407-235-8007. FRESH WATER BOAT (up to 12/2012)2008 Cruisers Yachts 460 Express Cruiser, with new AWLGRIP/AWLCRAFT PAINTED ROYAL NAVY HULL (12/2012) , Volvo D6 435 H.P. Diesels with 164 hours, Kholer Genset 9.5 KW, Sterm Thrusters and Bow Thrustes, Cockpit A/C, Cockpit Refrig and Freezer,Flex Teak on Swim Platform, and entire Lower and Upper cockpit and all steps (a $12,000 Value), done May 2012), Washer/Dryer Combo, 48 Mile Radar, KVH Sat/Direct TV Antenna with 4 TVs including 32" Cockpit TV, GPS, Cherry Cabin Entry Steps, Central Vac,(2) Chaise Lounge Chairs on Foredeck, Center Walk-way Steps for easy access to Bow, Dock side Retractable 50AMP Cable System, (2) Tables; Lower Cockpit and Upper Cockpit Table, 8 LED BLUE Lights in Cockpit Hard Top,and Under Water LED Blue Lights, Dual Mount For Tracvision, Radar, and Anchor LED Light, New Up Graded Isinglass done May 2012, Cherry Cabinetry, Up Graded 3 Sleeper Guest Bedroom, Two State Rooms, Two Heads and Two Showers. Also has a Buck Booster Step up Transformer in the Electrical Panel with an OFF/ON Switch. Some Marinas in Florida and other States only have 208 Volts at the Dock Pedestal and most times all you get to your Boat is 204 or 200 and you CAN NOT run more than 1 A/C unit, this boat has 3 A/C units and now I can run all three and I have 235 Volts. If I run the genset or go to a marina with full 240 Volts I can switch the Buck Booster off, very simple. This boat is professionally washed EVERY 2 WEEKs, and Waxed and Buffed Top Sides and Hull every 3 Months, (just completed December 20,2012) and that is why this boat looks Brand new inside and out. Maintenance of all engines, genset, oil, oil filters, impellers, rachor/fuel water separators, etc., etc., is completed every January and this will be completed January 2013, boat hauled out every December to power wash bottom and touch up bottom paint, zincs replaced, check for blisters, etc. Brand new bottom paint December 20 2012. Boat Located at Gulf Harbor Yacht and Country Club in Fort Myers, Fl. Any questions call Jim 407-235-8007. ASKING PRICE $319,900, List Price when new was $755,585. Stern Thrusters were a $10,000 up grade, AWLGRIP/AWLCRAFT Royal Navy painted Hull was a $5,000 upgrade, underwater lights are a $2,000 value, and there's brand new bottom paint.